No Fee, Examination, Just Nomination ! ALLEN CHAMP is one of the biggest honoring and mentoring ceremony of the best brains of India.Here we bring you the experiences and feelings of these champions and their parents shared with us at ALLEN Champion's Day. Get Rewarded on the basis of your Past Achievements; Become an ALLEN Champ. 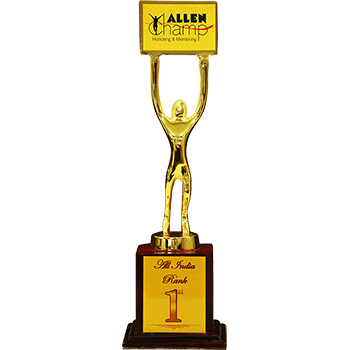 ALLEN Champ is India’s Unique Honoring & Mentoring program for rewarding the Academically Talented Students of the country. It aims at honoring the young champions of the nation, for boosting their confidence to perform better in future academic career. ALLEN Champ is a gift to the society by ALLEN where not only the Champions but their Parents and Schools will also be honored and rewarded. Register yourself online and complete the process. After successful registration, fill up your Profile Details. To proceed with the nomination, it is mandatory to fill in the complete profile information, upload your passport size photograph and the front page of your school’s latest report card. The nomination link would appear after a prescribed date. Select all the qualifying examinations for ALLEN Champ nomination, save them and upload the relevant documents against each of the selected achievement. Once the nominations are closed, kindly verify your details thoroughly and ensure they are correct before finally locking the transcript. To verify your details, kindly go through your “My Transcript” option in the control panel. At this stage you can modify the details earlier submitted by you. Read the instructions given on it carefully and accept the declaration given underneath. You can wait till the last date if any of your qualifying result is awaited. ALLEN will proceed to scrutinize the details submitted and locked by the students. Based on the nominations, we will shortlist 10 best student profiles from each class. These students will be invited for the final round of ALLEN Champ to be held on Champions Day along with their Parents. The lodging and boarding allowance will be provided to the Students & their Parents, as per their confirmation.